Nine or so years ago, I worked as a counselor at a summer camp in northern Vermont, a job that involved long hours working with kids nearly twenty-four hours a day. Counselors worked under the supervision of village directors, who had their own cabins, and generally allowed use of the building as a break room for those couple of hours that we had off when we weren’t teaching classes or had some down time with no responsibilities. Where I had been introduced to Dungeons and Dragons while a counselor in training in 2000, I was introduced to Bungie’s Halo: Combat Evolved, something that suddenly appeared in each of the four villages, and something that everyone seemed to play. Growing up, I had never really played video games at home – I’d played games on friend’s consoles at their homes. Halo was an eye-opening experience, one that appealed to me greatly after watching people play. I was drawn into the story, a tiny snapshot in a greater story that was both interactive and exciting at the same time. Where most of my friends had grown up on video games to various extents, I’ve never been all that great at them, and consequently, found myself playing the campaign over and over, playing the multiplayer sections when we organized major Halo tournaments late in the evenings. 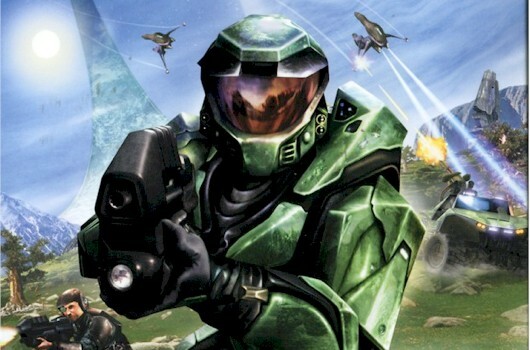 As a result, I’ve long enjoyed the first game, and when the black Xbox gave way to the white and error-prone Xbox 360, I found myself missing the game, but made the jump over to Halo 2 and 3 as they came out, as a whole variety of games exploded out of the gate. Halo is a franchise that I suspect will continue to grow to the point where it rivals Star Wars or Star Trek, the standard bar for science fiction franchises and success. The first game, a decade old, has done some impressive things over its lifetime: each of its sequels have been pretty popular, to the point where midnight releases are the norm for new entries, and a growing body of fans have begun making their own Spartan armor costumes. 343 Industries have also continued to publish books that continue the series along in the moments that you're not behind the visor of Master Chief. Quality-wise, they run the gambit from pretty standard fare, to some pretty impressive stories by some very good authors. Then, there's the movie to consider, which has languished in development hell for the past couple of years. It's going to be made - the franchise has already proven itself with a vibrant fan base that it's grown - it's just a matter of Microsoft working with other companies over financial matters. I've also got few doubts that a Halo movie, if properly handled (or even improperly handled), will make whomever films it a lot of money that will further bring the series into the public's eye. If the live action commercials that they've released are any indication, it'll be something to see. Halo, for me, stands out amongst a lot of other military science fiction stories. Like the Star Wars franchise, the first game doesn’t do anything other than drop you into the middle of a decades long conflict with little bits and pieces of a much larger story along the way, hands you a gun and has you play through the story. While the sequel games, novels and comics really flesh out the story, the first game was something special. I appreciated the somewhat realistic approach to the military that the game brought in, and the balancing between a contemporary story (that's really only gotten more relevant as the United States has been in a decade long war), and against some of the epic tropes of space opera. Like Star Wars, the Halo franchise seems to have pulled in influences from everything from Larry Niven's Ringworld or Iain M. Banks Culture series to Ridley Scott's Alien. The result is a product and story that checks all the boxes without feeling like there were boxes to be checked in the first place. Yesterday, I picked up the Halo: Combat Evolved Anniversary edition, and for the first time in years, played the original Halo. It's a little clunky with the new graphics at points, but my memory of the game came flooding back as I blew through the first couple of levels: It's really stood up excellently, even after all these years. It's a good reminder of the start (and something I'd hoped would happen eventually - an HD reboot), as the franchise continues forward. Hopefully, in ten years, the series will still be going strong.